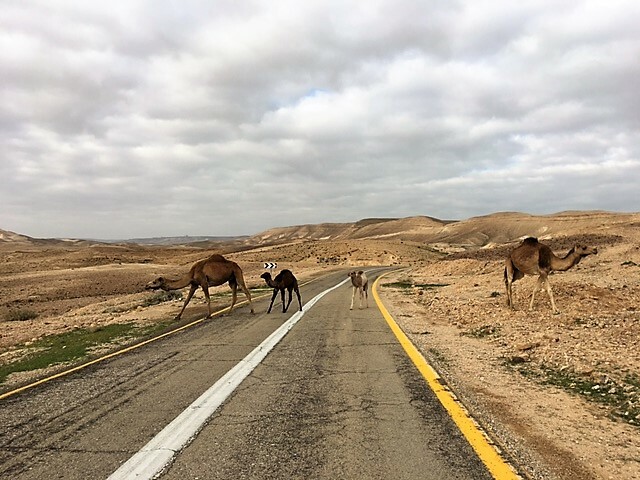 It was early Friday evening on Shabbat when we arrived in Arad, a small desert town with easy access to the western entrance of Masada and a short 33-mile drive to the Dead Sea. Our small apartment-style hotel, the Hahagala, located one mile from the center of town, was cared for by a kind, older couple. She spoke only Hebrew and he, Moeshe, a little bit of English. Moeshe and I gestured through conversation as I completed our hotel registration, and he kindly pointed to areas and places on a map to get gas, breakfast and refreshments at a small Russian grocery store in town. Most other area restaurants and shops were closed for Shabbat except the Russian grocery store and one small local restaurant. We went to the grocery store after unloading our bags and discovered a wonderful meat and cheese counter, which left us regretting our stop in Be’er Sheva for dinner. We grabbed a few things for the morning and headed back to our room to map out the next day. The balance of our small group wanted to rest until mid-morning—typically that would include me, but I had read Masada at sunrise was an unforgettable experience, so it was my duty to make sure everyone was awake and ready at 4:30 AM for our early morning drive to Masada. Turns out, it was worth it. It was a cloudy, dark morning ascending the ramp on the western side of the mountain. It was an easy climb (the eastern snake path is said to be much more difficult). We reached the plateau top overlooking the Judean Desert and the Dead Sea just minutes before sunrise. There we stood, looking out from the remains of the ancient fortress toward the backdrop of the sea and red-amber desert with sun breaking through a curtain of dark gray clouds, the sky flashing from gray to blue, and bright orange to gold. It was breathtaking. The Roman army consisted of 8,000 troops who built eight camps around the base of Masada, a siege wall, and a ramp on the western side to breach the walls of the fortress, according to the Israel Nature and Parks Authority (INPA). Per the INPA, these camps, fortifications and the assault ramp are the most complete remaining ancient Roman siege system in the world. After several months of the siege, the Jews’ hope diminished and the community’s leader ultimately convinced its 960 members to take the lives of their families, others and then their own, rather than fall into the hands of the Romans, as detailed by the INPA. When the Romans reached the plateau, everyone was gone. The Romans learned about the community's fate by a few remaining women and children hiding in the water cisterns. It was the first day of Passover. We walked around the UNESCO World Heritage site stepping into its ancient past, from the Northern plaza to the Southern water cistern (don't miss it!). There were 12 cisterns at Masada that were able to hold an impressive 40,000 cubic meters of water, according to the INPA. A duo was singling acappella in the cavernous Southern water hole which rang against the cistern walls. It was a reminder of the life that the cistern once help sustain. After climbing out, we left Masada to drive to the Dead Sea, the lowest point on Earth. During our drive through the Judean Desert, we were stopped by camels crossing the road (see photo in gallery below). And of course we had to get out and take a closer look before we continued our drive through the mountainous landscape. 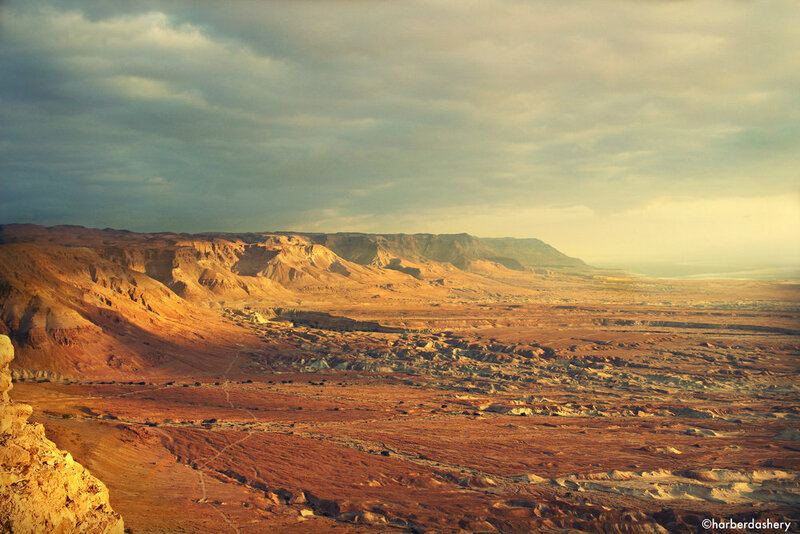 It took about an hour from the western side of Masada. With each turn, we dropped lower toward the sea—the decline, rapid. We drove toward Ein Bokek, a hotel and resort area on the Israeli seashore and found parking near the resort beaches. There, we accessed the sea between hotel buildings through a public site. It is much easier to find a spot to dip in than suggested on some tourist websites. You can go in anywhere. 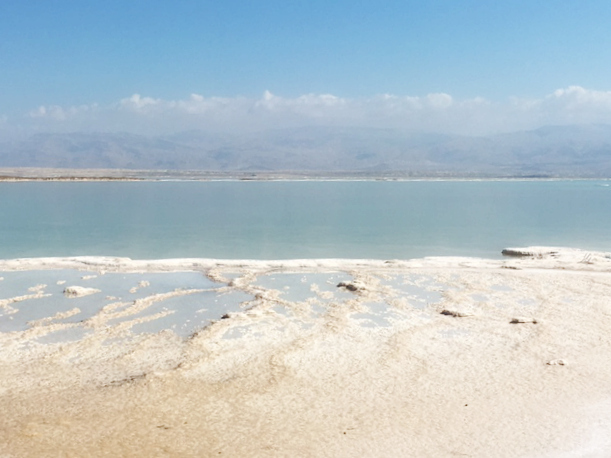 The beaches surrounding the Dead Sea are beautiful with white sand blending out into the the sun-bleached seafloor. We chose a spot near outdoor showers (amply available) and walked out. The sea floor is hard with a coral-like rugged crust, making water shoes necessary. The water is thick, briny and slippery—oily to the touch. You can easily sit back, float, and bob around like a cork due to the sea's high salt concentration. The experience is much like floating in a flotation therapy tank. The entire experience was worth the trip. It is necessary to rinse off the salty water as it dries quickly. We brought clothes to change into and used the outdoor restrooms to rinse out our swimsuits. I did not wear a swim cap and did not dip my head into the water. I was also careful not to get saltwater in my eyes or swallow any as everyone warns. Some have complained of their skin burning; my skin did not. I believe that's a myth to keep tourists away. My advice: just enjoy the float. Moeshe warned us "do not swim" because of the risk of water splashing into your eyes, but you can't anyway as the sea is very shallow. We went back to our hotel in Arad after we left the Dead Sea to shower, check out and head back to Tel Aviv for our evening flight to the United States. The early morning start gave us plenty of time to have an evening in Tel Aviv and catch the sunset. Before leaving Arad, we stopped at the Russian deli to buy lunch. My husband’s co-worker had gifted him a loaf of bread made by his brother who owns a bakery in Haifa. We purchased cheese, meats and mustard spread and had a picnic in a park. The food was as delicious as it looked in the deli case. When we arrived in Tel Aviv we: drank cocktails at one of the top bars in the world (Imperial); watched the sunset on the beach; and ate our final meal of delicious turkey shawarma at a hole-in-the-wall eatery before heading the airport. And that was the end of our trip (other than the ride home).